VersionOne is a one-stop-solution for performing agile and lean software development practices. It supports planning and tracking of epics, stories, themes, tasks, tests and issues distributed among different stakeholders in a single system. The tool also guides team members through each of the agile development steps from product and release planning to sprint planning, tracking, and review. However, senior executives, managers, product owners, developers, and testers using an Agile PPM tool like VersionOne also need to access and share information with other stakeholders of the project using different third-party tools for different ALM functions. This is needed for better cross-functional team collaboration that ensures higher visibility across teams, projects, and agile portfolios. Today large part of a successful project management depends on the integration of different tools used by different teams for their own purposes. Without integration in place, the job of the team members becomes extremely difficult as they need to hop around multiple tools to collect relevant information. This leads to the reduction of quality as well as productivity of the team members. The manual process of collecting and sharing cross-tool data to-and-fro with VersionOne and then aligning the data and processes with the project goals becomes burdensome and error-prone. Kovair addresses these pain points of Agile PPM teams by integrating VersionOne with its integration hub – Omnibus Integration Platform. The integration platform connects VersionOne users with the users of 60+ other COTS tools that are already integrated with Omnibus and used in different phases of an application lifecycle. 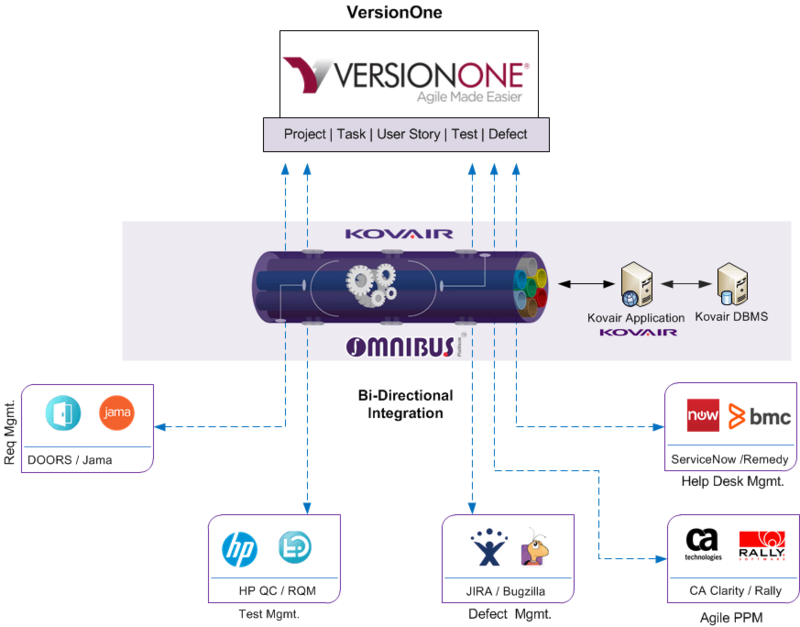 Kovair Omnibus, with the help of its integration adapter/connector for VersionOne, exposes VersionOne system assets or entity objects such as Story, Scope, Epic, Request, Issue, Defect, Task to Kovair, and thereby other Omnibus connected tools in an ALM ecosystem. It enables agile teams at all level – Enterprise, Portfolio, Program and Team remain synced to a single page of information and work together in harmony across integrated toolsets. Kovair currently supports integration with VersionOne version 15.2.1.9292. Plan, prioritize and execute releases and sprints with much needed information across tools and monitor for continuous improvement. Track scrum progress across toolsets, Add/Modify/Delete Sprints, and generate customized and intelligent cross-tool reports for better management visibility. View VersionOne Score Card directly from other project management tools like MS Project through scorecard URL linking and monitor the rate of project completion, % of defect raised and Backlog items without entering into the VersionOne tool. Add User Stories or Backlog items to VersionOne from any other Requirements management tools like Jama, DOORS, and vice versa. Get a bigger picture of the agile portfolio development progress in VersionOne by aligning strategic and cross-project initiatives to the other tools involved in the entire lifecycle. Achieve a seamless integration of VersionOne project portfolios with other popular PPM and ALM tools like CA Clarity, Rally Agile and thus create a larger, but synchronized portfolio, project, and application development environment for global teams. Gain direct access to defects in VersionOne from any defect tracking tools like JIRA, Bugzilla and then upon defect resolution, update status in VersionOne without entering into the other tool. Send defect status reports to Help Desk team from VersionOne to Help Desk or Service Desk management tool automatically. No manual intervention is required. Access User Stories or Backlog items in VersionOne from any third party test management tools like HP QC, RQM and Test Link, execute test cases there, and update test results in VersionOne without leaving the preferred testing environment. Get an integrated view of test elements across test, defect, requirements management and agile project management tools. Add customer support tickets directly to VersionOne tool as a User Story right from a Help Desk management tool like Remedy and ServiceNow. Get Ticket resolution status upon Issues/Change Requests fixed by developers and then notify customers automatically from within the Help Desk tool. No need to access agile development tools for the real-time updates. Establish real-time collaboration between Agile Development and Operations teams and improve customer relationships. Kovair with its 60+ tool integration capabilities expands the dimensions of VersionOne tool usage and offers a value-added Agile experience for all software development and delivery teams.